Congratulations to CWEE authors Dr. Loge, Dr. Spang, and Sara Miller for producing the American Water Works Association’s (AWWA) 2016 Management and Leadership Division Paper of the year, “Consumption-based fixed rates: Harmonizing Water Conservation and Revenue Stability.” published March 2015. 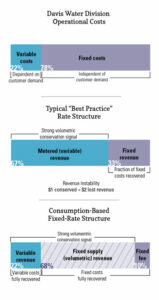 Implementing Consumption-Based Fixed Rates in Davis, Calif.
Consumption-Based Fixed-Rate model. Click for larger image. CWEE Director Frank Loge co-developed a water rate plan that offers strong conservation incentives to consumers while maintaining revenue stability for water utilities. 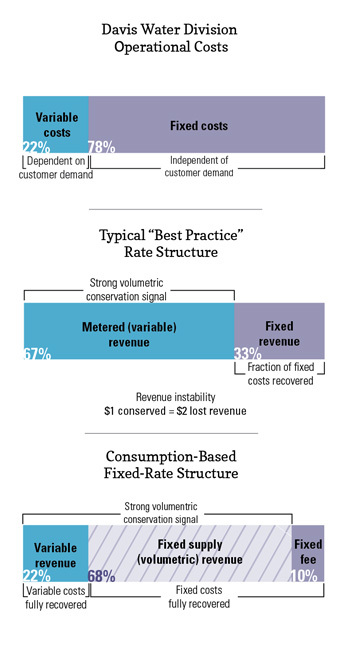 Dubbed Consumption-Based Fixed Rates (CBFR), the new rate structure ties a water utility’s fixed and variable costs to fixed and variable revenue assessed based on consumers’ actual use of water. Water utilities, especially those in California, are all too often finding themselves struggling to balance the competing objectives of ensuring stable revenue and promoting conservation. The most effective way to encourage conservation—raising the cost per unit of water delivered—ensures that when consumers do conserve, water utilities finds themselves with a revenue penalty in terms of unrealized sales, the only recourse being a rate increase for water customers. A water utility in this situation can neither invest in new efficiencies nor aggressively pursue ways to promote new efficiencies, for fear of financial shortfalls. CBFR enables water utilities to promote water conservation without fear of revenue instability…and ensures that ratepayers’ costs are fairly allocated based directly on their water system use. CWEE is working hard to eliminate this downward revenue spiral and provide a firm footing for “triple bottom line” conservation with Consumption-Based Fixed Rates (CBFR). Formulated by Frank Loge and others on the Davis Water Advisory Committee, CBFR enables water utilities to promote water conservation without fear of revenue instability. CBFR ensures that ratepayers’ bills are fairly allocated based directly on their water system use and that the water utility’s revenue stability is guaranteed no matter how aggressively its customers conserve. Because of these features, CBFR can be thought of as a good first step for many water agencies to embark on an aggressive program of water–energy conservation. CBFR was adopted by the City of Davis’s City Council in 2013 and the new rate structure was scheduled to be put into full effect in January 2015. On June 3, 2014, however, Davis voters passed Measure P, which immediately repealed the CBFR rates and prompted the City Council to launch another water rate study and selection committee. Despite its adoption challenges in Davis, we believe that CBFR would still benefit both customers and utilities alike and continue to promote its innovative ideas.